Tortoise-like internet connections and a temperamental Mac are hampering blog updates these days. 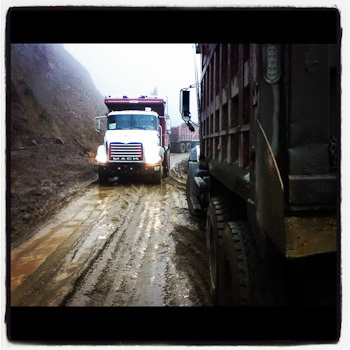 I’m now settled in to my guesthouse in Cajamarca, resting up after crossing the border into Peru, the first instalment of which is recounted here – an expanded post on my muddy shenanigans. 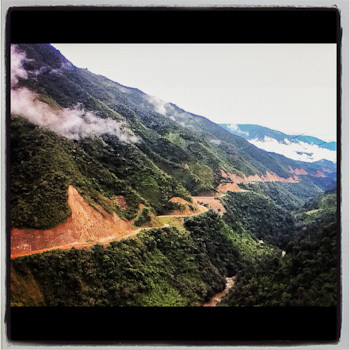 More on the stunning segment from San Ignacio to Cajamarca, via the Chachapoyan ruins of Kuelap, coming soon. 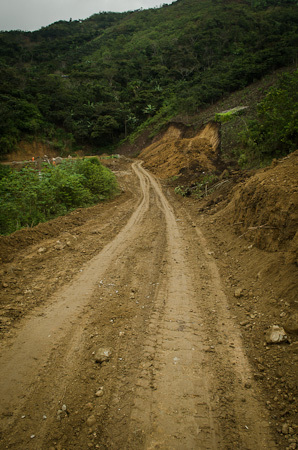 The remote route to the Peruvian border of La Balsa is both strikingly beautiful and notoriously hilly – even by Ecuadorian roadbuilding standards. Unfortunately, it’s also one that’s been in a state of metamorphosis over the last few years, as dirt slowly relinquishes itself to the progress of pavement. 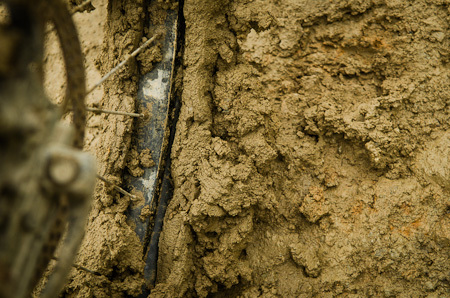 This isn’t mud. At least, not compared what’s to come. 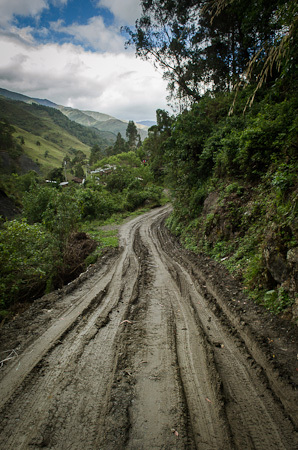 It is, however, a lovely dirt interlude in the paved stretch from Loja to Vilcabamba, spiralling down the valley from Caxarumi to Rumisitana. The trail even skinnies down to singletrack in places – disappearing altogether for a river crossing. 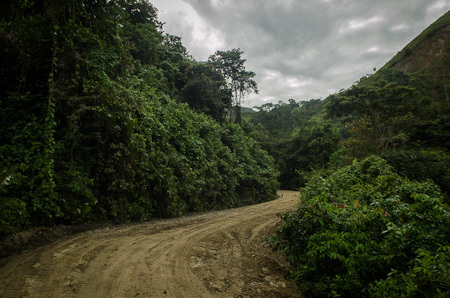 Beyond Malacatos, it’s followed up by another dirt road alternative into Vilcabamba. Look out for the deceptive signpost depicting a road rider sprinting in his drops – and then steel yourself for the rocky downhill that is definitely best ridden on a mountain bike. This second trail spits you out just before Vilcabamba, at a lowly 1500m. I found it to be a little on the weird side – its appealing climate and beautiful surroundings have transformed this quiet village into gringolandia, populated by North Americas and Europeans seeking the good life. Large, sprawling homes dot the countryside and hippy blond kids run amok. 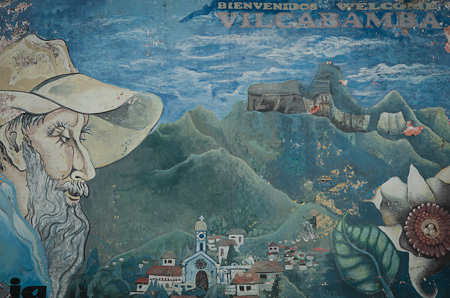 Vilcabamba is also known throughout Ecuador for the longevity of its inhabitants, many of whom are said to be centenarians. Their spritelyness is attributed to its climate, the lack of contamination in its soil and its mineral-rich groundwater. 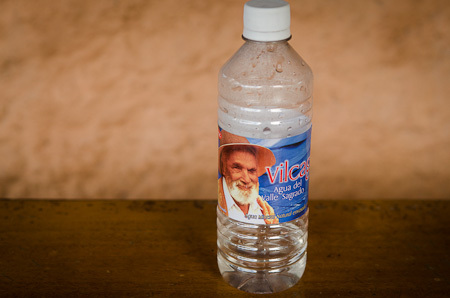 This elixir of life is even bottled – it’s not often the elderly are used in marketing. The surrounding mountains spill into the neighbouring Parque National Podocarpus, which range in altitudes from 900 to 3600m. 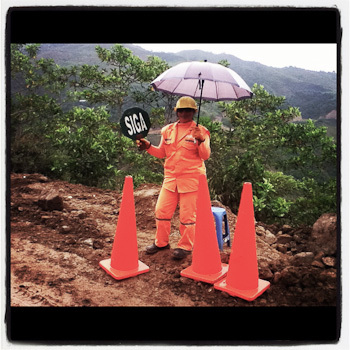 I’d been forwarned that conditions would be tough if the weather turns for the worse and rain falls once more – as it has been since Loja. After 35kms or so, pavement peters out, just as clouds creep in. Things are looking gloomy. Sure enough, rain is soon pelting down as I climb up in elevation, all views lost behind a shroud of thick mist. 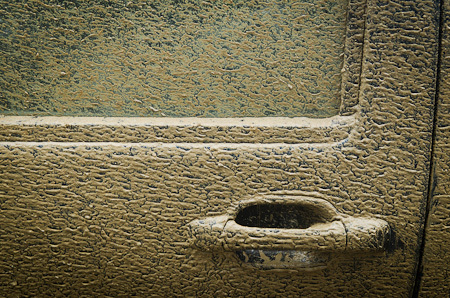 A steady to and fro of work trucks ensures the mud is churned continually. 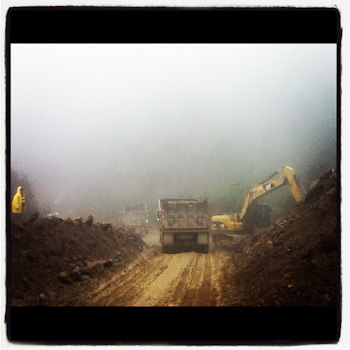 Road construction is a delicate time. Like magic, it seems even a drop of rain has the power to transform all terrain into a quagmire. I squeeze my way through, trying to avoid being splattered as trucks rumble by, their drivers giving me an encouraging thumbs up. I try and smile back. I’m not the only one getting muddy. That evening, I check into a simple guesthouse, where the paternal owners fuss over me (offering up a bag of fruit) and Ogre (a bucket of water). 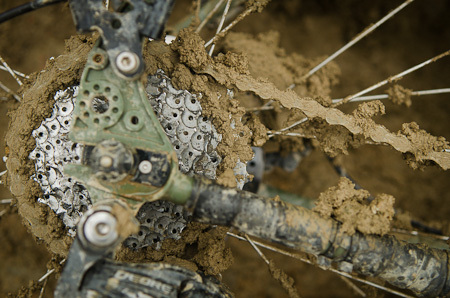 Listening to the rain, I remove the chain and dig out some rags for a session of drivetrain cleaning, before the anticipated follow-up round the next day…. Polanda to the border is known for its four sizeable inclines, each at gain at least 400 metres in altiude. Thankfully, the rain holds back despite brooding skies, the road quickly dries and I’m finally treated to some views as reward for my toils. 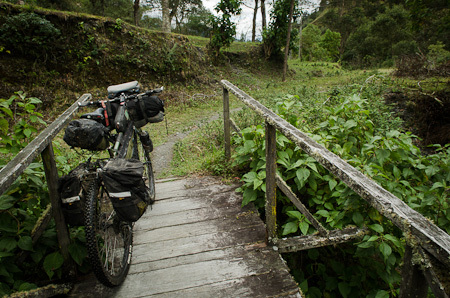 The dirt ahead shrinks right down in width, hemmed in by forest, all the while cranking up in steepness – a swan song to Ecuadorian riding. 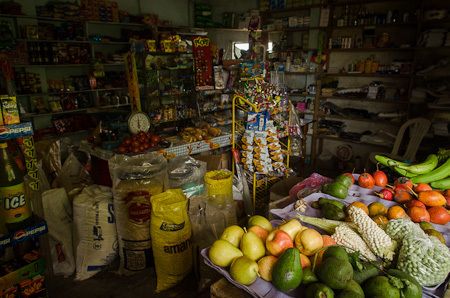 Going light and lean isn’t a problem if you come across village stores as well stocked as this one. I gorge on avocados and ice cream. Quick progress report on my lid, which has acquired some nice new stickers recently. Making the most of a rare break in the rain, villages sprinkle the streets with coffee beans. After granny-ring/big-ring rollercoasting up and down throughout the day, it’s time for the final descent down to the river at La Balsa, the natural boundary between Ecuador and Peru. As usual, I’m issued with a crescendo of vehement warnings. Watch yourself over there, says one man, glaring across the valley, before dramatically re-enacting being shot in the belly. Thanks for the positive vibes, man. 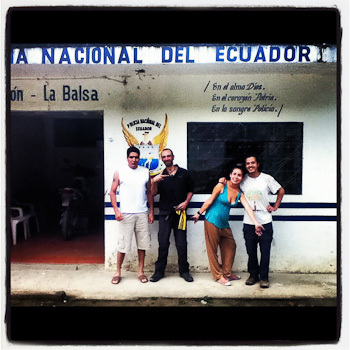 That night, I camp at the border, along with two Colombians – Kevin and Edgar, and Lola the Argentinian. This is one of Ecuador’s more laid back crossings, and our friendly guard even joins us for a group photo after stamping us out the next morning. 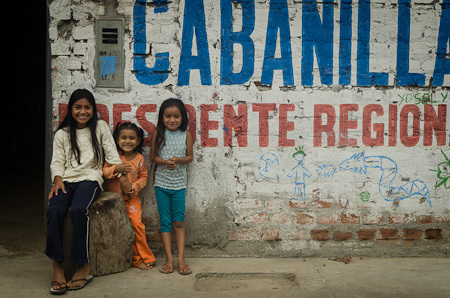 What will I miss from Ecuador? I obsess over a snack in each country I ride through. 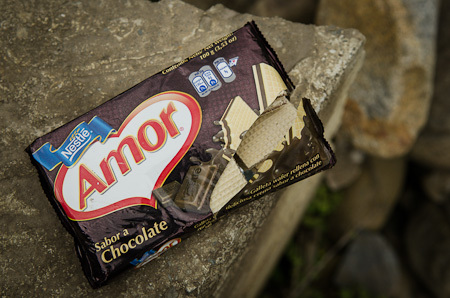 Here, it’s been Amor wafer biscuits, a dusty packet of which can be found in even the smallest of village stores. And this is my last one, paid for with almost-forgotten coins. Meet my Peruvian welcoming party. ‘Gringo!’ they hail, a word chirruped by every child who sets eyes a pale face. 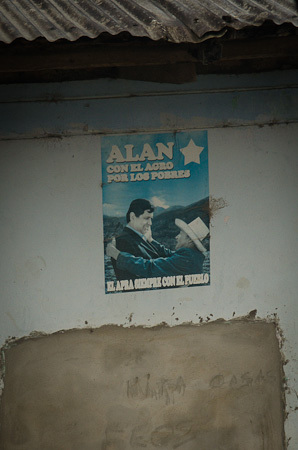 Note obligatory political slogans, omnipresent across the walls of Latin America. Having sent my panniers home, Ogre has been feeling noticeably more lively to ride, particularly bouncing down rough descents. The downside is that riding with a backpack means that sub 1000 metres, I’m often dripping in sweat. 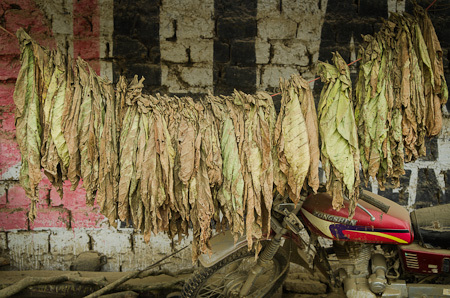 Tobacco leaves hanging out to dry. No rain, woohoo! Indeed, the first 20kms on the Peruvian side is perfect – hardpack dirt and bizarrely easy grades after what I’ve become used to in Ecuador. 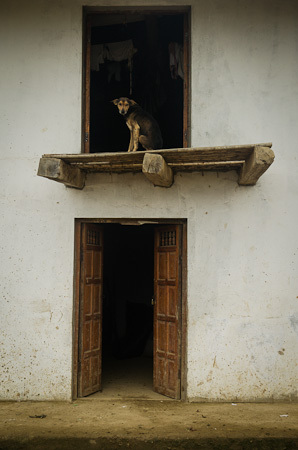 A forlorn dog, unable to snarl and snap at my heels, as popularised by the rest of his brethren. But… it seems like I’ve ‘woohoo-ed’ too soon. I crest a hill and drop into a valley where rainfall has been heavy that night. Somewhere in this claggy gloop is my tyre. Neon Lady says Go. I wish I could. Cue slip, slide and swear. At least there’s plenty of fuel to try and keep going. 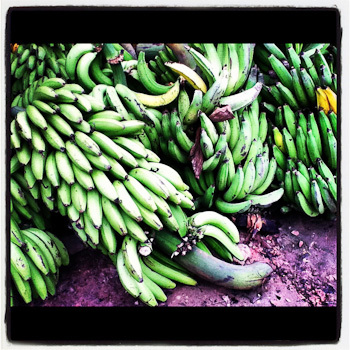 All around, it’s coffee and banana-growing country. 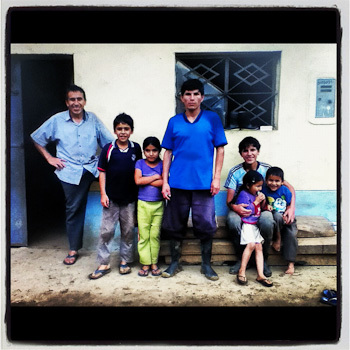 This extended family of coffee growers – the father has sired eight children – invite me in for soup and help me scrub down my bike. How many children do people have in England? he asks. One or two, I say. And in Ecuador? As many as you can, he winks… I teach them the word for flip-flop, perhaps the world’s most popular footware, and they teach me the term llanta cocuda – knobbly tyre. 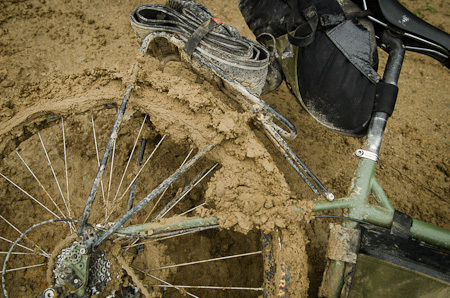 Unfortunately, a clean bike doesn’t last long in these parts. Although the rain let up, conditions are still a mess. Cars fishtail their way across the road. More political nonsense: elder peasant farmer and suave politician gaze admiringly at each other. 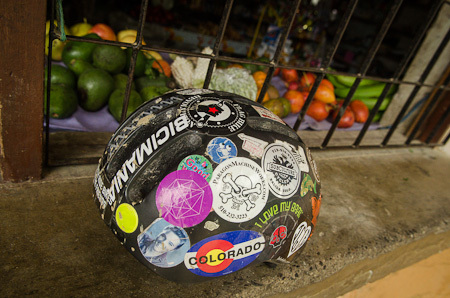 It’s a few hours riding from Loja to Vilcabamba, then a couple of solid days to the border at La Balsa. Polanda, Valladolid and Zumba all offer grungy places to stay. I have some route profiles I’ll post soon. 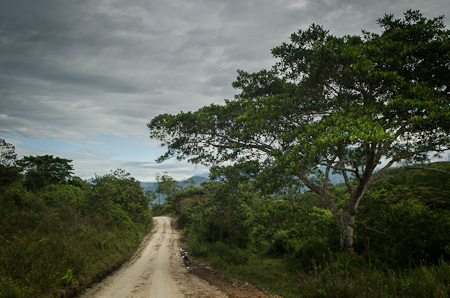 The first dirt road alternative from Loja to Vilcabamba paved stretch is just beyond the entrance to the Podocarpus National Park, as the road starts to descend. It adds a little in time, but not much in distance, paralleling the new road as it descends down through the valley. 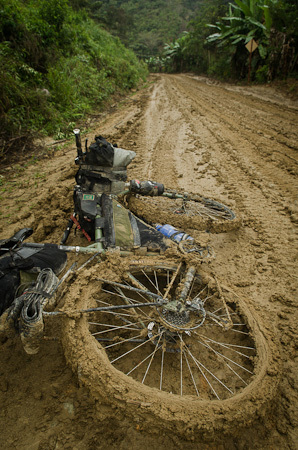 Most of it is in a good state of repair, though there are muddy sections if its been raining, and one push/carry for 20 mins or so. After riding through Malacatas and cresting the hill before Vilcabamba, look out for the cycling sign which points you to the right. 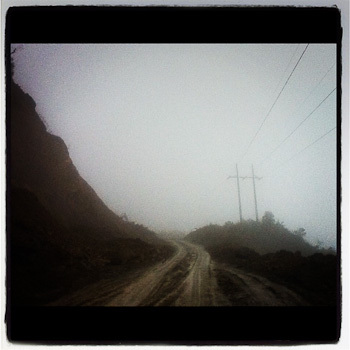 After a short climb, it drops you down on dirt just before Vilcabamba, on a fun singletrack littered with rocks. 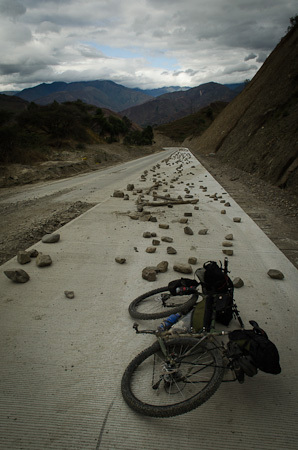 At the time of riding, the paved road beyond Vilcabamba lasted some 36km – each year, it’s extended. 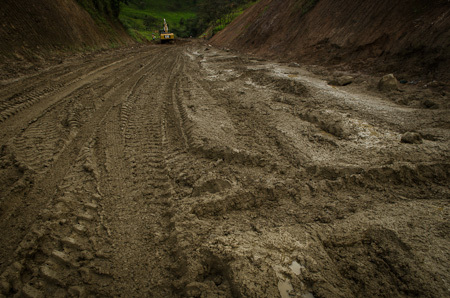 For me, the real mudfest was between Valladolid and Polanda in Ecuador, and Namballe and San Ignacio in Peru – but this will shift depending on where the road crews are working. 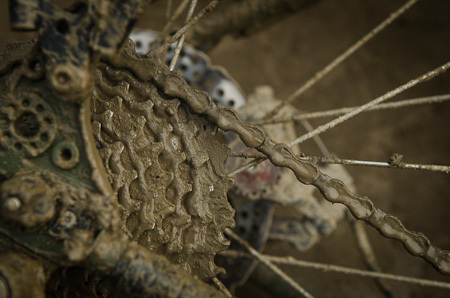 It only takes a half day of sun to dry out surfaces and make for perfect riding – but if it rains, expect some tortuous conditions. 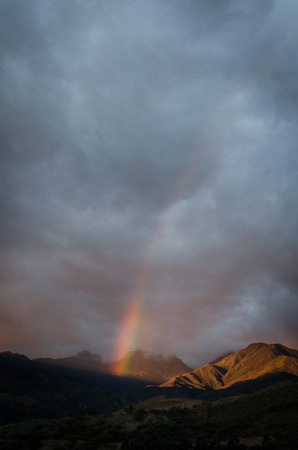 I camped in Vilcabamba. Given the rain, I stayed in a cheap guesthouse off the main plaza in Polanda – the one without the precariously steep flight of stairs – then camped again at the border. The exchange rate from the two shops there was 2.65 when I rode through, which is actually a good rate – so worth changing some cash to avoid the need to pass through Jaen when you’re in Peru. There’s a restaurant just across the river, on the Peruvian side, and plenty of places to eat and stock up on supplies in Namballe, 7kms or so further on. 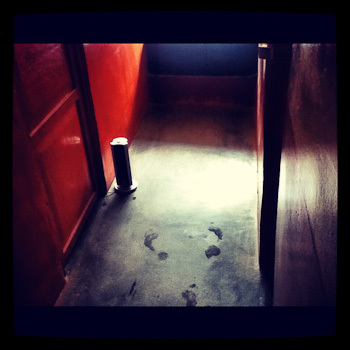 I just can’t get over how awesome your blog is. I’ve been following it for months and went back through all of the archives. 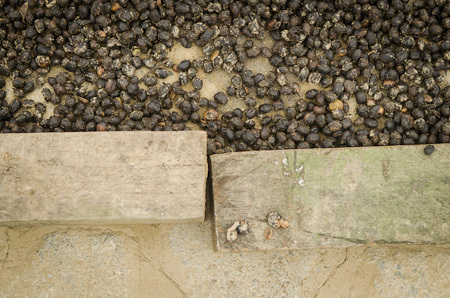 It’s incredible to me how you can take a subject as simple as coffee beans in the street and make a great photo of it. Thanks Jim, I’ll have to tap into that facebook page. I’m loving the Ogre (actually, and the Troll, I’m lucky enough to have ridden both…). They’re rock-munching beasts! Just came across this awesome blog today! I just read today’s post but plan to spend some serious time combing through the archives. If you want to be inspired, I strongly recommend you read Cass’ amazing travels. Wow, is all I can say. Safe travels Cass, we’ll be following you. Oh, be sure to check out his “about” and “gear” section too. Enjoy! Love the purple sticker…where did you pick that one up…looks like a more recent one. Reuben (Baby Boo as Noah calls him) is packing on the pounds…will send you a pic on Facebook. Awesome. 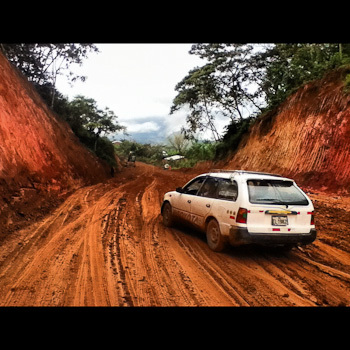 My exit from Ecuador will take this route. I hope it doesn’t rain!